Solid reading skills are a MUST for everyone on a college campus. The Rev It Up Reading Online Course builds confidence and competence to tackle ANY reading workload. Now's the time to get up to speed with what you read! I learned many great techniques to increase my reading speed and also increase my comprehension. I also learned some techniques for note-taking and organizing my life in general. This is the kind of course that will get your reading abilities from good to great, from great to excellent. I’m excited by the prospect of all the great reading I’ll be able to cover with the tools this course has taught me! Becoming an active, mindful and conscious reader. Reading faster and understanding more the first time. Finding the important information, quickly. Taking useful notes from reading material for future use. Time managing any reading workload. Increasing reading confidence and competence. Any university that considers itself an online campus offering online courses are also perfect candidates for recommending the Rev It Up Reading online course to its current and prospective students. All of my high school students completed the program, and loved it! It really helped boost confidence and comprehension. We were amazed at how easy it was to improve our reading speed. Our practice SAT scores certainly benefitted from the skills taught in the course. I will be spreading the word of your program to my college aged friends. Everyone needs to take the course! We offer an easy-to-follow online speed reading course divided into nine, half-hour modules. The course takes a total of about five hours and includes 17 timed reading exercises and the ability to email Abby with any questions at any time. We offer great group discounts for schools, colleges and universities. Abby has helped thousands of college students get up to speed with what they read! She LOVES working with college students and will come to your campus to present her popular speed reading workshop, geared especially for college students. Schedule your workshop early before the calendar fills up! Scroll down to see what’s covered. 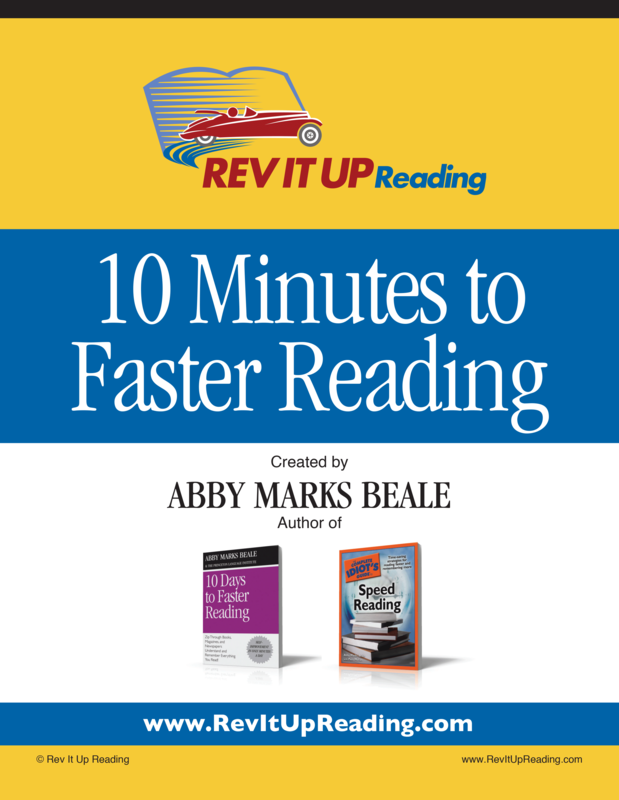 . .
Abby creates, designs and personally presents interactive speed reading webinars of varying lengths and topics. Get the personal touch without the cost of in-person training. Most webinars include downloadable handouts. What’s your current reading speed and what does it mean? Hire Abby to come to your school. Contact her to schedule your workshop. This program is really helpful if you’re not a very confident reader and does not spend a lot of time reading, it helped me not only improve my reading and confidence, but also increased my desire to reading. I am well on my way to becoming the strong, efficient reader I will need to be for college. I went from struggling with my reading and getting decent grades to speeding through my reading with A’s! Thank you so much! Check Out the Rev It Up Reading Online Course for FREE! Now’s your chance to start getting up to speed with what you read! Experience what the Rev It Up Reading course looks like and begin to see what it can do for you. Enjoy free access to Abby’s favorite exercise called “Discipline Your Eyes” and all of Module 4. No charge! All you’ll need is a valid email address and a Mac, PC, Tablet, or iPad. One full day starts at midnight and ends the following midnight. Sigm up for Rev It Up Reading Now! FREE One Day Pass to Rev It Up Reading! Experience what the Rev It Up Reading Online Course looks like and begin to see what it can do for you. If you like what you see, you’ll be offered a special discounted rate for either the 90 Day or 365 Day Course Access. One full day means midnight to midnight. You have successful joined. Check your email for login instructions. . . .AND get access to Abby’s free resources including 10 Minutes To Faster Reading and her favorite exercise, Discipline Your Eyes. As a bonus you will get a $50 off coupon code to purchase the full version of the Rev it Up Reading Online Speed Reading Course.